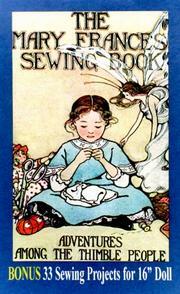 I believe one of my all time favorite books has to be the Mary Frances Sewing Book. I remember from my youth the reading of this book. Very pleasurable reading at any age! Still looking for a nice original copy, but in the meantime there are many reprints to be had both in hard back and paperback. Even found free as a pdf or for my Kindle! For the free copy go to Open Library and download the version you wish. Want to see the entire wardrobe from the book all sewn up? Lovely page of finished garments. So nice to take the time to do something just for you! I had an old, old copy of this when I was a child--I spent hours poring over it--never made a thing from it, but I dearly loved the book! I really want to share with my granddaughters! Plus tetras just for me. Loved it! Poor typing... LOL... Meant "to read" just for me.